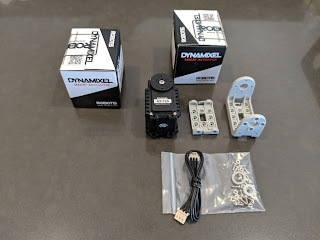 After my poor experience with hobby servos, a friend recommended Dynamixel robot actuators. Their entire reason for existence is to accurately go to a given absolute angle in response to commands over a simple, convenient network protocol (in this case, a half duplex daisy chained 3-wire connection that also supplies power). I'm waiting on shipment of a kit that includes the USB2AX interface dongle. The USB2AX seems weirdly overpriced for what it is, but it sure beats having to mess around trying to get a generic full duplex serial interface to work in half duplex mode, or bit-banging directly. I will report on results one way or the other.